Xbox executive Mike Ybarra: "It's something that we should look into." When Microsoft launches its New Xbox One Experience this week on November 12, gamers who own a library of over 100 Xbox 360 titles will be able to play those games, for free, on the Xbox One. But PC gamers won’t be extended the same privilege. What this means, for example, is if gamers bought Borderlands or Gears of War for the Xbox 360, they'll be allowed to play that game on the Xbox One, thanks to the Xbox 360 software emulation that Microsoft is building. But if a PC gamer previously purchased either title, he or she wouldn’t receive any credit for doing so under the new scheme. “It’s certainly something that we’re looking at in terms of getting people the content they want wherever they play, but nothing that’s in place today,” Ybarra said. Why this matters: As much as Microsoft has supported PC gaming with updates to the DirectX API, PC gamers are quite familiar with Microsoft’s other shortcomings: the Games for Windows DRM scheme, for example, and the woeful game offerings on the Windows Store. It would be awfully nice to wash some of that bad taste out of gamers’ mouths. We called out how unfair Games with Gold’s paid tier was in May 2014; a month later, Microsoft dramatically revamped it. We’d love to see this happen again. 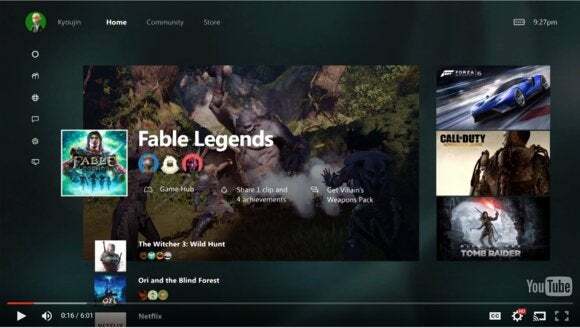 The New Xbox One Experience (NXOE) is the first step in bringing the Xbox One and Windows 10 environments closer together. Although the main selling point is a new, streamlined interface, features like Cortana and the Xbox 360's backward-compatibility are selling points, while game streaming to the Xbox app on Windows 10 PCs allows an Xbox One to be played from another room in the house. It’s still not quite finished, though. Although Microsoft said in June that Cortana would be part of the New Xbox One Experience (NXOE), the company disclosed later that she would be added at the beginning of next year. Although Cortana sneaked into an early build of the NXOE, that feature has since been turned off. The idea, according to Ybarra, is that Microsoft wants to build in specialized commands to allow Xbox users to take advantage of the console’s capabilities. “We want to make sure that it’s relevant to the gaming community,” Ybarra added. “So we want to take a little extra time to make sure the quality is there. And what we mean by that is if you say ‘Hey Cortana, is Ralph online?’ Cortana has to have the context to look at your friends list, see if Ralph’s online, and come back” with the right response, comparing his real name against his Xbox Live gamertag, he said. As with many other Microsoft products, Microsoft uses its “UserVoice” sites as ways to gauge customer demand for particular features. But it also looks, anonymously, at how particular features are used—or not used. For that reason, gestures that use the Kinect sensor have been phased out of the NXOE, Ybarra told Windows Central. (Voice control via the Kinect microphone has been left in, however, as have Kinect gestures inside games. It also seems unlikely that PC-to-Xbox One streaming will happen soon, although Microsoft first begun talking up the possibility back in March. According to Ybarra, the topic receives quite a lot of interest from PC gamers, but has fallen out of the top 30 most requested features on the Xbox One UserVoice site. Keyboard control, another promised feature, has already been included, although just for text input, according to Windows Central. Like Windows 10, the NXOE will continue to deliver preview updates before they’re rolled out to the general public. With the Windows 10 “Threshold 2” release due soon as well, it looks like this week could be an important one both for Microsoft and its users.